September 17, 2018 – This event was canceled because of weather. Come to hear this nationally known conifer expert talk about these chiefly evergreen trees and shrubs that include pine, fir, spruce, and yews. Roberts is currently the Curator of Herbaceous Plants at the Norfolk Botanical Gardens. Doug Ruhren has over 30 years experience working with gardens that include Chatwood Camellia Gardens, Montrose, Daniel Stowe Botanical Gardens and the American Camellia Headquarters. 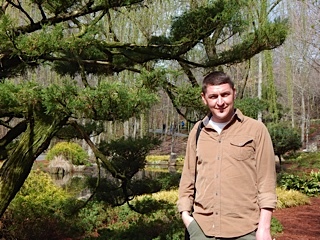 He is currently the Gardens Manager at JC Raulston Arboretum on the campus of NC State University. As an independent garden designer, Doug’s work is on display at numerous gardens and nurseries around the country. Bio: Sam started his career in farming as a hydroponics retail store manager. After forming 100 Gardens with Ron Morgan, Sam has been the lead designer for 100 Gardens’ aquaponics installations in schools, correctional facilities, trade shows and in Haiti. Sam was the horticulture instructor at the Stonewall Jackson Youth Development Center in Concord, NC and also currently sits on the Board of Directors for the Friends of St. Vincent’s School for the Handicapped in Port au Prince, Haiti. Sam is a Charlotte, NC native, and a graduate of Vance High School. Sam currently plays guitar for regional metal band Dirty South Revolutionaries. Started as a rebuilding strategy for victims of the 2010 Haiti earthquake, 100 Gardens has evolved into a multifaceted educational program focused on aquaponics as a platform for experimental learning and a sustainable means of food production for the future. Sam Fleming serves as Co-Director and is putting this Charlotte-based non-profit on the national radar. Dru and Wan Marsh, formerly with Harris Teeter and a close friend, will help us decorate for the holiday season and then give the audience the opportunity to take something spectacular home (either through purchase or auction). BIO: Susan is a native North Carolinian and moved to Charlotte a little over 37 years ago. Not long after moving there, she became an empty nester and began working for a local grower on the weekends. There she received payment in the form of plants and learned first-hand about perennials, annuals and ground covers. After retiring from consulting in the Financial Services Industry, she began working as a volunteer at Winghaven in the herbs department. This was her first introduction to herbs. Before long, she was hooked and began experimenting with growing herbs in pots since she didn’t have very much sun. She joined the Charlotte Herb Guild (which maintains an herb garden at the Charlotte Garden Council House on Seventh Street and the Hezekiah Alexander House) and got thoroughly immersed in all things herbal. Since their meetings begin with food prepared by fantastic cooks that feature herbs, her personal focus concentrated on culinary herbs. She became a Master Gardener in 2013. And finally, after a major change in sunlight in her yard, she planted an actual herb garden in 2015. She uses the garden, in addition to the patio pots, as trial beds to find new (to Charlotte) culinary herbs that will do well in our climate and soil conditions. When plants perform well for her, she uses a local grower to produce plants for sale at Winghaven’s semiannual fundraiser. BIO: Marian St.Clair is a freelance garden writer, photographer, and tour coordinator who nurtures an earth-friendly landscape in Greenville, South Carolina. She worked for the Greenville News for 16 years, contributing both feature articles and weekly columns until August 2018. Currently, she pens “A Carolina Gardener’s Story” for Carolina Gardener Magazine. Currently living in Greenville, SC Marian comes from Virginia and attended Virginia Tech. She is a Master Gardener, Master Naturalist, garden columnist, and garden tour coordinator, organizing trips to Europe and other areas of interest. Marian is a nationally known horticulture expert and garden blogger. This program is not-to-be-missed. Ozone pollution not only affects human health but plant health too. Clean Air Carolina is planting ozone gardens in parks and schools around Charlotte to raise awareness of the health impacts of this summertime air pollutant. This program looks at school ozone gardens explaining what they are and how to create one. It will also take a step back and look at the value of having gardens in school settings, the challenges they face and tips for success. BIO: Mary works with Clean Air Carolina as the Manager of their Clean Air for Kids Program. She works hands-on within schools and the community, using ozone gardens and citizen science to “Make air visible”. She teaches the importance of clean air, shows ways to protect our health, and actions we can take to protect air quality. Her background includes degrees in biology, environmental studies, a science teaching credential, and a Master’s in education. As a former science teacher, she taught composting classes for Mecklenburg County for over eight years and has worked for the Soil and Water Conservation District as an Urban Conservationist. She volunteers with Catawba Lands Conservancy and is an emeritus Extension Master Gardener for Mecklenburg County. Originally from Long Island, NY John is a graduate of the Forestry Program of Oregon State University and has spent over 40 years in the forestry industry working as a forest ranger, firefighter, national parks ranger, certified arborist, and with American Electric Power. He is most comfortable “in the woods” and will bring up-to-date information from a recent month-long trip to some of our national treasures. BIO: John P. Ertz – Retired natural resources manager with 43 years of experience in forest, wildlife, Christmas tree and utility vegetation management throughout the Mid Atlantic, New England and Pacific Northwest regions. 1975 B.S. Forest Management Oregon State University. Mr. Ertz has worked in both private industry and government service with the National Park Service, Oregon Department of Forestry, American Electric Power and as a private consultant. Licenses and certifications include Maine Licensed Forester #723, VA Certified Pesticide Applicator and Certified Arborist – Utility Specialist. Mr. Ertz resides with his wife Marilyn in Southwest Virginia. His interests are photography, woodcarving and traveling.